For the university in Ottawa, Kansas, see Ottawa University. 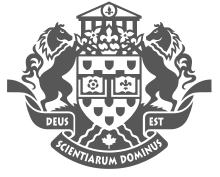 The University of Ottawa (uOttawa or U of O) (French: Université d'Ottawa) is a bilingual public research university in Ottawa, Ontario, Canada. The main campus is located on 42.5 hectares (105 acres) in the residential neighbourhood of Sandy Hill, adjacent to Ottawa's Rideau Canal. The university offers a wide variety of academic programs, administered by ten faculties. It is a member of the U15, a group of research-intensive universities in Canada. The University of Ottawa is the largest English-French bilingual university in the world. The University of Ottawa was first established as the College of Bytown in 1848 by the first bishop of the Catholic Archdiocese of Ottawa, Joseph-Bruno Guigues. Placed under the direction of the Oblates of Mary Immaculate, it was renamed the College of Ottawa in 1861 and received university status five years later through a royal charter. On 5 February 1889, the university was granted a pontifical charter by Pope Leo XIII, elevating the institution to a pontifical university. The University was reorganized on July 1, 1965, as a corporation, independent from any outside body or religious organization. As a result, the civil and pontifical charters were kept by the newly created Saint Paul University, federated with the university. The remaining civil faculties were retained by the reorganized university. The school is co-educational and enrolls over 35,000 undergraduate and over 6,000 post-graduate students. The university has more than 195,000 alumni. The university's athletic teams are known as the Gee-Gees and are members of U Sports. The university was established on 26 September 1848 as the College of Bytown by the first Roman Catholic bishop of Ottawa, Joseph-Bruno Guigues. He entrusted administration to the Missionary Oblates of Mary Immaculate. The college was originally located in Lower Town, housed in a wooden building next to the Notre-Dame Cathedral Basilica. However, space quickly became an issue for administrators, triggering two moves in 1852 and a final move to Sandy Hill in 1856. The Sandy Hill property was donated by Louis-Theodore Besserer, where he offered a substantial parcel from his estate for the college. The college was renamed College of Ottawa in 1861, following the city's name change from Bytown to Ottawa. In 1866, the college received its first charter, as well as university status, making it the final institution in Canada to receive a Royal Charter from London before the British North America Act, 1867 made education a provincial responsibility. By 1872 the university had already begun to confer undergraduate degrees, with master's degrees coming in 1875 and doctoral degrees in 1888. On 5 February 1889, the university was granted a pontifical charter from Pope Leo XIII, elevating the university to a pontifical university. The university faced a crisis when fire destroyed the main building on 2 December 1903. After the fire, the university hired New York architect A. O. Von Herbulis to design its replacement, Tabaret Hall. It was among the first Canadian structures to be completely fireproof, built of reinforced concrete. Women first enrolled in 1919. Tabaret Hall under construction in 1903 (completed in 1905). Construction began earlier in the year after fire destroyed the University's main building. In the fall of 1939, a Canadian Officer Training Corp was established at the university, with training beginning in January 1940. The Canadian Officers' Training Corps, University of Ottawa Contingent, which comprised a company, headquarters and three platoons in 1939, was authorized to become a battalion in 1940. By 1941, the unit swelled to 550 men. An air force Officers' Training Corp was created in 1942 and a naval Officers' training corp in 1943. Participation in one of the three corps became mandatory for all students over 18, although they were not obliged to participate in the actual war at the end of their studies. During this time, the Royal Canadian Air Force used parts of the university's grounds for training and the university constructed barracks to house members of the Canadian Women's Army Corps. In total 1,158 students and alumni of the university enrolled the Canadian Forces during the Second World War, of which 50 died overseas. The unit was eventually disbanded during the unification of the Armed Forces in 1968. The university was reorganized on 1 July 1965 as a corporation independent from any outside body or religious organization, becoming publicly funded. As a result, the civil and pontifical charters were transferred to the newly created Saint Paul University, federated with the corporation, while the remaining civil faculties were retained by the reorganized university. Constructed in 1893, 100 Laurier Avenue East is the oldest building at the University. The building was acquired by the University in 1970. In 1970, 100 Laurier East became property of the University of Ottawa, acquired at a cost of $1,120,900. Previously named Juniorat du Sacré-Coeur, the property became the university's oldest building after it was acquired. At a cost of $28,000, it was built by Joseph Bourque, a Hull contractor and church builder, and completed in 1894. The Juniorat du Sacré-Coeur provided classical education for young men who wished to pursue a religious life and join the Order of the Oblates of Mary Immaculate. The building was expanded in 1937, an expansion that was indistinguishable from the original structure. The huge cross that used to dominate the top of the building was removed after its purchase, leaving only small references to the building's religious history as the Juniorat du Sacré-Coeur. The property now houses the university's department of Visual Arts. It is located at the corner of Laurier Avenue and Cumberland Street, near the Rideau Canal. In 1989, Dr. Wilbert Keon of the University of Ottawa Heart Institute performed the country's first neonatal artificial heart transplant on an 11-day-old baby. On 11 November 1998, during the University of Ottawa's 150th anniversary celebrations, two war memorial plaques were unveiled in the foyer of Tabaret Hall which honour 1000 graduates of the university community who took part in armed conflict, especially the list of 50 graduates who lost their lives. The engineering building, Colonel By Hall, was unveiled in September 2005 as a memorial dedicated to Lieutenant-Colonel John By, Royal Engineers. The university's main campus is situated within the neighbourhood of Sandy Hill. The main campus is bordered to the north by the ByWard Market district, to the east by Sandy Hill's residential area, and to the southwest by Nicholas Street, which runs adjacent to the Rideau Canal on the western half of the University. As of the 2010-2011 academic year, the main campus occupied 35.3 ha (87 acres), though the University owns and manages other properties throughout the city, raising the university's total extent to 42.5 ha (105 acres). The main campus moved two times before settling in its final location in 1856. When the institution was first founded, the campus was located next to the Notre-Dame Cathedral Basilica. With space a major issue in 1852, the campus moved to a location that is now across from the National Gallery of Canada. In 1856, the institution moved to its present location. The buildings at the university vary in age from 100 Laurier (1893) to 120 University (Faculty of Social Sciences, 2012). In 2011 the average age of buildings was 63. In the 2011-2012 academic year, the university owned and managed 30 main buildings, 806 research laboratories, 301 teaching laboratories and 257 classrooms and seminar rooms. The main campus is divided between its older Sandy Hill campus and its Lees campus, purchased in 2007. While Lees Campus is not adjacent to Sandy Hill, it is displayed as part of the main campus on school maps. Lees campus, within walking distance of Sandy Hill, was originally a satellite campus owned by Algonquin College. Morisset Library is the main library for the university and houses the majority of its special collections. The University of Ottawa Library is a network of twelve locations with holdings of more than 4.5 million titles in monograph and electronic form as of 2016. The main library is in Morisset Hall, which also houses the Media Centre, Archives and Special Collections, and the Geographic, Statistical and Government Information Centre. The university has five other specialized libraries: the Brian Dickson Law Library, located in Fauteux Hall; the Health Sciences Library, located at the Roger-Guindon campus; the Management Library, located in the Desmarais Building; the Isobel Firestone Music Library, located in Pérez Hall; and the Annex, an off-site storage facility that houses less-used portions of the collection. The University of Ottawa Museum of Classical Antiquities was established in 1975 as a teaching collection, operated by the Department of Classical and Religious Studies. Composed of artifacts which reflect daily life during the period from the 7th century BC to the 7th century AD, the permanent collection is enhanced by touring exhibitions. The university also houses a student-run gallery space, known as Gallery 115 on the main floor of 100 Laurier East. The student-run gallery provides students the opportunity to work within a gallery setting. It provides graduate and undergraduate students a chance to develop curatorial and administrative skills, as well as, display their own art pieces. In co-operation with the University of Ottawa, the Gallery operates under a democratic structure representing many students enrolled in various programs, including Visual Arts, Art History and Art Administration. Thompson Hall is one of ten student residences at the University. Although most students live off-campus, the university has ten student residences: Brooks, Le Blanc Hall, Marchand Hall, Stanton, Thompson Hall, Hyman Soloway, Friel, Henderson, Rideau, 45 Mann and 90 University. The university offers a variety of housing options. Four of the seven residences are conventional single and double bedrooms. Brooks and Hyman Soloway are 2–4 bedroom apartment-styled residences, while 90 University is a two bedroom suite-styled residence. On January 24th 2018, the new Annex residence was officially announced to students in an email newsletter from the school's 'The Gee' news outlet. The new residence (due to open in September 2018) will have 1-5 bedroom units including studio-styled single rooms. In September 2010, 26.2 percent of first-year students lived on campus, part of the 8.8 percent of the overall undergraduate population which lived on campus. Residents are represented by the Residents' Association of the University of Ottawa (RAUO). With a mandate to help improve the quality of life in residences, each building elects a representative to the association. The RAUO also provides a political representation on the behalf of the residents. Buildings may collect a small fee, known as the floor fund to pay for the group. The Jock Turcot University Centre (UCU) is the centre of student life and programming. Located between Montpetit Hall and Morisett Library, the centre was completed in 1973 at a cost of over C$6 million.In spring of 2017, an expanded rooftop patio was added to the University's 'UCU', allowing students to have a more open campus in a downtown setting. Funding for the centre was partially offset by the Jock Turcot University Fund, which was set up by the student body. The centre was named after former student federation president Jock Turcot, who was killed in a traffic collision in 1965. The university has over thirty five dining outlets. This includes several major restaurant chains. Off-campus faculties are located throughout Ottawa. The university owns and operates another campus located in Ottawa's Riverview neighbourhood, known as the Health Science or Alta Vista campus. Located on Smyth Road, the Health Science campus is 7.2 ha (18 acres). The campus primarily serves the Faculty of Medicine as well as hosting programs for the Faculty of Health Sciences. Roger Guindon Hall serves as the primary building for students at the campus. The Health Science campus is located in between The Ottawa Hospital and the Children's Hospital of Eastern Ontario, both of which are university-affiliated. Many of the hospital's health professionals and researchers teach in the Faculties of Medicine and Health Sciences. Medical and health sciences students learn on the job at The Ottawa Hospital. The university operates the Centre for Executive Leadership at the World Exchange Plaza. Located on O'Connor Street in Downtown Ottawa, the centre is primarily used by the Telfer School of Management's Executive Master of Business Administration program. The centre includes one amphitheatre-style classroom, seven case rooms for team meetings, collaborative work and/or independent study and conference and boardroom spaces. The green wall in the Faculty of Social Science building is the tallest living biofilter in North America. The green wall is one example of the University's sustainability projects. Several programs from the university placed in the 2011 Corporate Knights rankings, which measures how well Canadian universities integrate sustainability into their curriculum. Telfer School of Management ranked fifth in Canada for undergraduate business programs. The Corporate Knights also ranked Telfer eighth in Canada for MBA program. The University of Ottawa has implemented a variety of activities in order to increase sustainability across campus. The university has been working on creating a more sustainable campus through the efforts of the Office of Campus Sustainability. One of the main programs occurring at the University of Ottawa to promote waste reduction is RecycleMania. RecycleMania is a competition among colleges and universities that occurs within a 10-week period of time. Each school is to report their trash and recycling data which are then ranked according to the largest quantity of recyclables. The purpose of this competition is to see who has the highest recycling rate. As results fluctuate among competitors, schools get more enticed to keep reducing waste. In 2011, the University of Ottawa was awarded first place among Canadian universities in the RecycleMania competition. The university also ranked 14th out of 180 universities in the “waste minimization” category in the international RecycleMania competition. The RecycleMania program will continue to encourage and inform University of Ottawa students on how to change their consumption habits as well as recycle. One of the newer programs initiated by the University of Ottawa is the Free Store. The Free Store is a location in which students can drop off items they no longer want and pick up items they do want for free. The reason this was created was to reduce consumption by offering free items to students who no longer want items that may be used by someone else. Items that are dropped off include clothing, textbooks, electronics, and office supplies. The Free Store is located at 647 King Edward. In 2007, the Office of Campus Sustainability coined the term “Gratuiterie” as the French translation to their Free Store. Since then, the concept of la Gratuiterie has gained widespread popularity in France, namely in Grenoble where the first Gratuiterie appeared. Since then France has seen a boom of “Gratuiteries” around the country. On September 1st of 2010, the University of Ottawa stopped selling bottled water on campus and created a bottled water ban in order to reduce plastic consumption, and encourage students to carry reusable water bottles and use campus water fountains. The University of Ottawa put forth $150,000 to improve the water fountains across campus. The new Social Sciences Building at the University of Ottawa is the school's latest green initiative. The fifteen-storey building that took about four years of planning and construction to complete opened its doors in September 2012. The Social Sciences Building that cost a grand total of $112.5 million provides students and faculty with an array of space for individual studying and group work. This building is the newest addition to the University of Ottawa with its green and sustainable architecture and facilities. This building is very different among the rest of the university's buildings as its structure and characteristics are very eco-friendly. Some features that the building includes are: construction materials that were chosen due to their recycled content, a living wall that is five stories tall and composed of numerous plants that with act as an air filtration system, and a green roof. The green wall is the tallest living biofilter wall in North America. The wall is situated in the main agora of the Faculty of Social Science building and is visible from the outside. The green wall is a unique component of the building's air handling system, for it is capable of treating a large quantity of air at a time, and it provides a source of humidity that doesn’t need to be artificially introduced. The living wall was built on 14 October 2012, by Diamond & Shmitt Architects. Eighty percent of the building's heating will be recycled and created through the building's data centres (computer labs, etc.). This heating system will also heat nearby buildings including Vanier Hall. Not only has the University of Ottawa stayed true to their reputation of being on the forefront of sustainable living by creating the green wall, but they have also created a green roof, which is potentially the first green roof constructed on a Canadian university campus. The green roof was established in 1971 on the rooftop of the Colonel By building. One of the faculty's goals is to achieve an LEED Gold Certification, which is given to green buildings that meet specific environmental guidelines. In 2006, the University of Ottawa established the first community campus garden. Over the course of the past eight years, the community garden has expanded in terms of the number of plants that occupy it, and has grown into a full-fledged garden containing more than thirty pots in various locations on campus. The community garden is open from early spring until mid-autumn. In addition to the various eco-friendly accomplishments that have been added to the university over the years, in 2005, the university established a boreal forest and wetland environment, and is in the middle of creating a living classroom for students to enjoy. The University of Ottawa is on the rise to being one of the top eco-friendly Canadian universities in North America. The University of Ottawa has also introduced a bike share program to encourage cycling to and from school. The university offers free bicycle rentals and access to free maintenance and repair workshops. Along with new bike routes and services, the university has enhanced car-pooling and shuttle services, and is also located next to the transit way to encourage students to use public transit via a discounted university student bus pass. The Association for the Advancement of Sustainability in Higher Education (AASHE) provides various activities that attempt to increase sustainability practices among individuals and institutions, promote resource sharing, and make sustainable practices a norm within higher education institutions. The Sustainability Tracking, Assessment and Rating System (STARS), created by AASHE, was designed to provide guidelines for better understanding of sustainability and build a more sustainable community throughout university campuses. It is a way for universities and colleges to measure their sustainability efforts. The program compares higher education facilities’ sustainability initiatives and ranks them based on their efforts. In 2011, the University of Ottawa received a silver star by the STARS program. The Office of Campus Sustainability continues to create various events and programs to promote sustainability among students at the University of Ottawa. They are responsible for informing students of all initiatives and programs put forth by the University. Eco-friendly initiatives are growing rapidly at the University of Ottawa with the help of the office. Tabaret Hall was named after Joseph-Henri Tabaret and houses the university's administrative offices. Governance is conducted through the Board of Governors and the Senate, whose roles were established by the University of Ottawa Act, 1965. The Act describes their membership and powers, as well as their principal officers. The Board provides overall governance and management, including financial decisions and the implementation of policies and procedures. The Board consists of an executive committee which includes the Chair of the Board and the Vice-Chair and Chair of the Executive Committee. As stipulated by the act, the board comprises no more than 32 members, appointed or elected by the various parts of the university community. While not stipulated in the act, the board's membership includes elected undergraduate and graduate student representatives. The Board includes one honorary member, the current chancellor. The Senate sets educational policies and the management of academic issues. Such powers include the ability to create and abolish faculties, departments, schools and institutes, academic regulations, admission standards, degree and diploma requirements. It confers certificates, degrees at all levels and with the approval of the board, honorary doctorates. The Senate consists of 72 members including president, who acts as its chair. Other members of the Senate, as mentioned in the act, include the chancellor, the president, vice-presidents and the dean of each faculty, including those of federated universities. While not outlined in the act, the Senate includes students from each faculty. As stipulated in the act, the chancellor is the university's titular head and is accorded a place of honour at commencement exercises and other functions and may preside at examinations. The chancellor is appointed by the board with the concurrence of the Senate and holds the office for one or more four-year terms. The president is the chief executive officer and chairman of the Senate with the responsibility of managing the direction of academic work and general administration, teaching staff, officers, servants and students. The president is appointed by the board and continues until the board votes otherwise. The office was first referred to as superior until the university received a pontifical charter, when the name changed to rector in 1889. In 2004, the English title of rector was replaced with president. Net assets as of 30 April 2016 stood at $1.767 billion. The University completed the 2015–2016 year with revenues of $973.610 million, expenses of $986.843 million and a deficiency of revenues under expenses of $13.233 million. The largest single source of revenue originates from operating grants, valued at $382.762 million for the 2015-2016 academic year. The second-largest source of revenue is tuition fees, which reached $361.184 million. As of 30 April 2016, its endowment was valued at $241.944 million. The university was registered as an educational charitable organization in Canada on 1 January 1967. As of 2015, the university was registered primarily as a post-secondary institution. The university's Institutional Research and Planning department estimated that its students, staff, visitors and the institution itself brought in an estimated total of $4.12 billion into the local economy in 2011. This research university is a member of the Association of Universities and Colleges of Canada. It functions on a semester system, operating fall/winter and spring/summer sessions. Undergraduate programs comprise the majority of the school's enrolment, with 35,515 full-time and part-time undergraduate students, compared to 6,741 graduate students in 2018. Excluding Saint Paul, the university conferred 7,449 bachelor's and professional degrees, 208 doctoral degrees, 1,815 master's degrees in 2015. The Official Languages and Bilingualism Institute, a language institute affiliated with the University, is housed at Hamelin Hall. As of 2016, the university was the world's largest English-French bilingual university. The university is one of the three bilingual universities in Ontario that is not federated with a larger university. Since its inception the university has seen itself as fostering English-French bilingualism. However, bilingualism was only made an official university policy in 1965 when the Government of Ontario passed An Act respecting Université d'Ottawa through the Legislative Assembly of Ontario. Section 4 of that Act specifically states that an object and purpose of the university is"to further bilingualism and biculturalism and to preserve and develop French culture in Ontario", and "to further ... Christian principles". Despite that law, these parts of the university's mandate are now arguably superseded by the 1982 Canadian Charter of Rights and Freedoms, which constitutionalizes multiculturalism (not biculturalism) and freedom of religion. The university operates the Official Languages and Bilingualism Institute (OLBI). The OLBI was officially opened on 1 July 2007, replacing its predecessor, the Second Language Institute. Both institutes promoted English-French bilingualism, although the OLBI holds an expanded mandate, to strengthen research, innovation and outreach efforts in official languages and bilingualism. The university is a member of the Association of Universities of the Canadian Francophonie, an association which promotes post-secondary education and research in French. While the university maintains bilingualism as an official policy, students need not be bilingual. Instead, most courses and programs are offered in both languages. As of September 2011, the percentage of students who used French as their primary language of education was at 31.1 percent, while the number of students which use English as their primary language for education was 68.7 percent. As of March 2009, 68.6 percent of professors in bilingual positions were considered to be actively bilingual, while bilingual staff comprised 91.5 percent. The University of Ottawa has ranked in a number of university rankings. According to the 2018 Academic Ranking of World Universities rankings, the university ranked 151–200 in the world and 7–9 in Canada. The 2019 QS World University Rankings ranked the university 289th, and 13th in Canada. The 2019 Times Higher Education World University Rankings placed Dalhousie 176th in the world, and seventh in Canada.In the 2019 U.S. News & World Report Best Global University Ranking, the university placed 208th in the world, and eighth in Canada. In terms of national rankings, Maclean's ranked the university 9th in their 2019 Medical Doctoral university rankings. Ottawa was ranked in spite of having opted out — along with several other universities in Canada — of participating in Maclean's graduate survey since 2006. The university has also placed in a number of rankings that evaluated the employment prospects of its' graduates. In QS's 2019 graduate employability ranking, the university ranked 301-500 in the world, or 9–17 in Canada. The University of Ottawa Heart Institute at the Wilbert Keon Building, houses over 60 principal investigators and 175 researchers for cardiovascular medicine. The university is a member of the U15, a group of research-intensive universities in Canada. Research at the University of Ottawa is managed through the Office of the Vice-President, Research. The university operates 40 research centres and institutes including the Ottawa Health Research Institute and the University of Ottawa Heart Institute. In 2018, Research Infosource ranked Ottawa 9th on their list for top 50 research universities in Canada, with a sponsored research income (external sources of funding) of $324.581 million in 2017. In the same year, the university's faculty averaged a sponsored research income of $246,800, while its graduate students averaged a sponsored research income of $47,000. The largest source of research funding comes from the federal government, which provided $142.8 million in 2010. This was followed by the provincial government, which provided $31.2 million and the corporate/private sector which provides $25.8 million in research funding. The university's research performance has been noted several bibliometric university rankings, which uses citation analysis to evaluates the impact a university has on academic publications. In 2018, the Performance Ranking of Scientific Papers for World Universities ranked Ottawa 146th in the world, and eighth in Canada. The University Ranking by Academic Performance 2018–19 rankings placed the university 152nd in the world, and eighth in Canada. The University of Ottawa's cooperative education program is an optional program which presents students with excellent work experiences and other various benefits the program has to offer. The program is offered for both undergraduate programs and certain graduate programs. The program was first introduced to the school over 30 years ago, in the year 1980. The University of Ottawa's co-operative program has expanded very quickly since its creation and now stands as the second largest program in Ontario with a placement success rate of over 98 percent. The co-operative education program is designed to generally have students work full-time during altering semesters, in their area of study. One work term generally lasts 15 or 16 weeks. Every work term is a paid work term where students’ pay varies on the program of study related to their job; however, student pay can range anywhere from 400-700 dollars per week. In addition to the hands-on experience students may acquire through this program, the co-op program at the University of Ottawa can further offer a range of services to the students such as: one on one consultations concerning resume or cover letter reviews, various workshops, and numerous training possibilities for different purposes such as for interview preparation and work term success. The University of Ottawa's co-op program claims to offer excellent experiences to students as the program maintains “regular contacts with over 4000 active private- and public-sector employers throughout the year”. The University of Ottawa's co-op program has five fees, with prices varying each year. There is a fee issued for each work term and an additional free which is paid when the student accepts the co-op offer for the training and support provided by staff leading up to the work terms. The fees go towards the preparation and training of students, allowing them to develop a better understanding of the job market, resume reviews, and extensive preparation for interviews and jobs. In addition to the Telfer School of Management, the Desmarais Building also houses the offices for the University's co-operative education program. Each year, about a thousand students are accepted into the University of Ottawa's co-op program. However, this number is a rough estimate because it is based upon job availability and is thus altered every year. Students are accepted into the program through their academic achievement. Based upon this, there are general requirements one must follow in order to successfully apply and be considered for the co-op program at the University of Ottawa. In order to keep a reserved co-op spot, a student must maintain an 8.0 average throughout their first year. Although for some programs it may vary, generally a student is able to apply for the co-op program at the beginning of their second year of study; in order to begin their first work term the summer before their third year of study. The minimum CGPA required for applying to most undergraduate programs is a 6.0. For graduate students, the minimum CGPA is a 7.0. In order to be eligible for a co-op program at the University of Ottawa, a student must be considered a full-time student and maintain the requirements for their program of study as well. Furthermore, depending on the chosen program of study, one needs to complete certain required mandatory courses beforehand. Lastly, many programs require that a student be a Canadian citizen, permanent resident, or an international student with authorization or a permit allowing them to work. The University of Ottawa's co-op program is available for a wide range of programs for undergraduate students. Co-operative programs are offered in English and in French for certain programs. There are various programs offered in the following faculties: arts, social sciences, engineering, science and law. The faculty of arts offers the option of co-op for the following programs: communications, lettres françaises, English, environmental studies, geography, history, and translation, along with the option of combining two programs in cases where a student is completing a joint honours program (i.e. sociology and communications). The faculty of social sciences offers co-op options for the following programs: anthropology, sociology, human rights, conflict studies, economics, political science, international development and globalization, public policy, and public administration. In the faculties of arts and social sciences, work terms usually begin in the second summer of a student's studies (where a student is done second year and entering third) with the exception of the translation program where the first work term begins the summer before a student's fourth year. Each program offers specific conditions that a student must meet in order to participate in his or her placement. For the science and engineering faculties, the co-op programs offered are: chemical engineering, mechanical engineering, civil engineering, computer engineering, computer science, electrical engineering, software engineering, other various engineering programs, biomedical science, chemistry, biology, biochemistry, earth sciences, physics, environmental science, statistics, and other various science programs. All the engineering programs offered at the University of Ottawa begin during the summer before a student's third year. However, the science faculty's programs offer different starting points for the different programs mentioned above. The University of Ottawa's co-op's page offers a more detailed view on these starting points. The faculty of law offers a co-op program for civil law in French. The requirements consist of the same general requirements for acceptance and maintaining a position in the program. The Telfer School of Management at the University of Ottawa also offers a co-op option for some of their programs including: accounting, finance, management, marketing, international management, human ressources management and Management Information Systems and Analytics. With the exception of accounting which starts during the summer before a student's fourth year, all programs start the summer before a student's third year of study. Finally as a last category, several co-op graduate programs are offered as well: computer science, economics, globalization and international development, history, information studies, and public and international affairs. The entry requirements for graduate students are a little different from those for undergraduate co-operative education programs. In the graduate level, one of the requirements of the co-op program is that it is crucial that students begin their study in the fall semester because of the co-op program's placement cycle. The option of completing a work term abroad is also a possibility through the University of Ottawa's co-op program. Although there may not be as many job opportunities abroad directly presented, the opportunity still remains. However, most of the work terms abroad are discovered by students themselves, outside the co-op program. Typically, the requirements remain the same as for the co-op program itself. In certain cases, additional features may be considered. If one is considering working abroad there are information sessions held to further inform students at the University of Ottawa on work term abroad possibilities. The sessions outline what students should expect, various costs of living abroad, and the challenges they may come across. Furthermore, if a student chooses to pursue a work term abroad, the University of Ottawa's co-op program offers further assistance right up to the departure date in order to ensure student success. Services offered may include meeting with a professional development specialist in order to compose a job-finding strategy, learn various success strategies, and work towards having everything ready before the departure date. In addition, training can be offered to help prepare students with an idea of what to expect, necessary documents, and further information on the work they will be completing and the country students may be traveling to. The University of Ottawa's co-op program may provide students with a wide range of benefits. In addition to relevant work experience students acquire from the provided work terms, other benefits may arise from choosing the co-operative education program. For example, students can begin to build a network of contacts throughout their co-op work terms. Furthermore, students learn more about resume building and develop strong techniques for successful interviews. This can lead to a student's increased ability to find a job more easily after graduation. Due to their work experience, students may hold a stronger advantage in the job market. In addition, many students may struggle with paying for tuition fees, thus, the University of Ottawa's co-op program provides a solution by offering the opportunity for students to earn an income throughout their studies. The program's staff is composed of experienced and friendly specialists who are dedicated to help students reach their goals. It is with these benefits and many others tied into the program for which numerous students choose to participate in co-operative education programs such as the ones offered at the University of Ottawa. Admission requirements differ between students from Ontario, other provinces in Canada and international students, due to the lack of uniformity in marking schemes. The admissions office maintains that an admission rate of at least 73 percent is required, although the rate may increase based on the popularity of a program. The 2015 secondary school admission average is 83.9 percent. The highest admission average is science, and the admission average is 86.5 percent. The 2015 acceptance (registrant) rate of first choice student is 45.6 percent. The 2010 secondary school rate for full-time first-year students, including Saint Paul was 82.1 percent. The retention rate for first-time, full-time first year students in 2009 was 86.1 percent. Students may apply for financial aid such as the Ontario Student Assistance Program and Canada Student Loans and Grants through the federal and provincial governments. Aid may come in the form of loans, grants, bursaries, scholarships, fellowships, debt reduction, interest relief and work programs. In 2011-2012, the university provided $71.458 million in financial aid and scholarships. The two main student unions on administrative and policy issues are the The University of Ottawa Students' Union (UOSU) for all undergraduate students and the Graduate Students' Association (GSAÉD) for graduate students. Additionally, graduate (and undergraduate) students who are employed as research assistants, teaching assistants, markers, proctors, and lifeguards are members of CUPE2626, a local chapter of the Canadian Union of Public Employees. The union and the university are bound by a collective agreement. In addition, most faculties have student representative bodies. Resident students are represented by the Residents’ Association of the University of Ottawa. More than 175 student organizations and clubs are officially accredited by the student union, covering interests such as academics, culture, religion, social issues and recreation. Many of them center on the student activity centre. Two non-profit, independent student newspapers publish at the university. The Fulcrum publishes in English and is a member of the Canadian University Press, while La Rotonde publishes in French. Campus radio station CHUO-FM (89.1 FM), Canada's second-oldest, began broadcasting in 1984. The UOSU recognizes three fraternities; Sigma Chi, Sigma Alpha Mu and Omega Theta Alpha; and ten sororities, Delta Delta Delta, Alpha Phi, Nu Sigma Pi, Omega Phi Sigma, Sigma Beta Phi, Xi Delta Theta, Zeta Theta Xi, Theta Sigma Psi, Delta Phi Nu, and Kappa Beta Gamma. On December 24, 2018 the Student Federation of the University of Ottawa lost its official status as a student union, following a termination of their agreement. The University cited the SFUO's handling of allegations of financial mismanagement, fraud, and workplace misconduct as the reason. In 2019, students voted to choose a new undergraduate student association in a referendum. On February 11, 2019 the University of Ottawa announced the results of the student referendum. The University of Ottawa announced the University of Ottawa Students’ Union (UOSU) had been selected as the new student union to represent undergraduate students. The University will make its best efforts to have a new agreement in place by May 1, 2019. The Minto Sports Complex is one of three athletic facilities operated by the University. The facility is used by the student body, as well as by the University's varsity team. Athletics and student recreation at the university are managed by Sports Services. Varsity teams compete in either Ontario University Athletics or Réseau du sport étudiant du Québec conference of U Sports, varying by team. The university hosts 29 competitive clubs, including 10 varsity. The first athletic group at the university was formed in 1885, with garnet and grey becoming the official team colours. Shortly thereafter, garnet and grey became the official colours of the university. Varsity teams' names are a play on the initials of the colours. Varsity teams did not immediately adopt a name, leading others to refer to them by their colours–"Garnet and Grey" in English, Grenat et Gris in French. Ottawa sports media referred to the teams as "GG" for the teams, a nickname that could easily be used in both English and French. Eventually the shorthand became official. Because the term gee gee also describes the lead horse in a race, the horse became UOttawa's mascot. The university owns and operates three athletic facilities on the university's two campuses. Montpetit Hall and Minto Sports Complex are located on the main campus and another is located on Lees. Montpetit is centrally located on campus and is the home to the varsity basketball and swimming teams. The Minto Sports Complex houses the university's two arena ice rinks, which seat 840 as well as Matt Anthony Field the home of Gee-Gees soccer and rugby, which seats 1,500. In 2013, the university opened Gee-Gees Field a new stadium for its varsity football team located at Lees Campus. The new stadium holds over 4,000 spectators and serves as the first on-campus home to the Gee-Gees football team in 120 years. Along with the stadium came all new facilities including: new team rooms, coaches’ offices, dedicated athletic therapy and video rooms. All facilities are shared with both recreational users, as well as varsity teams. The university does not provide full-ride athletic scholarships. On the recreational level, the university's sports services operate intramural sport leagues and tournaments with a participation rate of one in eight students. Sports include badminton, volleyball, basketball, swimming, soccer and martial arts. Philémon Yang, 8th Prime Minister of Cameroon. Paul Martin, 21st Prime Minister of Canada. Sir Edward Morris, 1st Baron Morris, 2nd Prime Minister of Newfoundland. Abdiweli Sheikh Ahmed, 17th Prime Minister of Somalia. Gabriela Michetti, 36th Vice President of Argentina. Louise Arbour, United Nations High Commissioner for Human Rights. Alex Trebek, television personality and host of Jeopardy! Graduates have found success in many fields, serving as the heads of diverse institutions in both public and private sectors. As of 18 October 2011, the university has 167,224 alumni. Faculty and graduates have accumulated numerous awards including Governor General's Awards and the Pulitzer Prize for Fiction. Recipients of the Governor General's Award include Michel Bock, Christl Verduyn and Pulitzer Prize winner Carol Shields. Several Chancellors of the university had previously held positions such as Governor General of Canada, or the Viceregal consort of Canada. Examples include Pauline Vanier, 46th viceregal consort of Canada, Gabrielle Léger, the 48th viceregal consort of Canada, Maurice Sauvé, the 50th viceregal consort of Canada, and Michaëlle Jean, the 27th Governor General of Canada. A number of alumni have also gained prominence serving in government. Four heads of government attended the university, including Edward Morris, 1st Baron Morris, the 2nd Prime Minister of Newfoundland, Paul Martin, the 24th Prime Minister of Canada, Philémon Yang, the 8th Prime Minister of Cameroon, and Abdiweli Sheikh Ahmed, the 17th Prime Minister of Somalia. The 36th Argentinian Vice Presidents, Gabriela Michetti had also taken career specialization courses at the university. Premiers include Paul Okalik, 1st Premier of Nunavut, and Dalton McGuinty, 24th Premier of Ontario. Six graduates have been appointed puisne justices, with one moving on to become a Chief Justice of Canada. Puisne justices include Louise Arbour, Michel Bastarache, Louise Charron, Louis LeBel, Richard Wagner and Gérald Fauteux. Fauteux and Wagner would later become a Chief Justice of Canada. Prominent business leaders include Daniel Lamarre, president and CEO of Cirque du Soleil, Paul Desmarais, chairman of the Power Corporation of Canada, André Desmarais, president and CEO of the Power Corporation of Canada, Calin Rovinescu, president and CEO of Air Canada, and André Ouellet, Postmaster General of Canada, CEO and president of Canada Post. Alex Trebek, host of the game show Jeopardy!, after whom a building was named on the university campus. Cathleen Crudden, multi-award-winning professor of chemistry. Dafydd Williams. an astronaut for the Canadian Space Agency was also a graduate of the university's medical school. ^ The university used the form 'Universitas Ottaviensis' on its Latin diplomas, and on old versions of its coat of arms, as still seen on the front of Hagen Hall: Sonnen, John Paul (14 December 2011). "Universitas Ottaviensis". Orbis Catholicus Secundus. Alternatively, 'Universitas Ottawensis' appears at the base of the statue in front of Tabaret Hall: "Père Joseph-Henri Tabaret O.M.I." Waymarking.com. ^ a b c d e "Financial statements" (PDF). University of Ottawa. Retrieved 21 December 2016. ^ a b c d e f g h i "Quick Facts 2016". University of Ottawa. Retrieved 21 December 2016. ^ a b "Student Registrations by Level of Study, Attendance Status, Student's Gender Language in Use, Immigration Status, and Co-Op enrollment" (PDF). University of Ottawa. 2018. Retrieved 12 March 2018. ^ "The official colours". University of Ottawa. Retrieved 12 February 2012. ^ a b c d e "About the Gee-Gees". University of Ottawa. Archived from the original on 2 May 2012. Retrieved 27 May 2012. ^ "Faculties and departments". University of Ottawa. Retrieved 25 May 2012. ^ "U15 Submission to the Expert Review Panel on Research and Development" (PDF). Review of Federal Support to R&D. 18 February 2011. Retrieved 25 May 2012. ^ a b Keshen, Jeff; St-Onge, Nicole (2001). Ottawa - Making a Capital. University of Ottawa Press. p. 79. ISBN 0-7766-0521-6. ^ a b c d e "About the History of the University of Ottawa". University of Ottawa. Retrieved 25 May 2012. ^ a b "Saint Paul University History". Saint Paul University. 2012. Retrieved 25 May 2012. ^ Woestman, William H. (1995). The Missionary Oblates of h Mary Immaculate: a clerical religious congregation with brothers. Saint Paul University. p. 297. ISBN 0-9192-6137-X. ^ a b Prévost, Michel (2005). "Childhood Friends". Tabaret: The magazine of the University of Ottawa. Retrieved 6 June 2012. ^ Beaton, B. (2012). "University of Ottawa". The Canadian Encyclopedia. The Historica Dominion Institute. ^ Prévost, Michel (2004). "1994: Prime Minister Honoured". Tabaret. University of Ottawa. Retrieved 15 June 2012. ^ "Timeline". University of Ottawa. Retrieved 15 June 2012. ^ a b c d "Fonds 71/237 - Canadian Officers' Training Corps University of Ottawa Contingent fonds". ^ a b Prévost, Michel (2006). "A University at War". Tabaret. University of Ottawa. Retrieved 15 June 2012. ^ "Ottawa Citizen - Google News Archive Search". ^ "Oldest Building, University of Ottawa". L'Express. Archived from the original on 19 October 2014. Retrieved 14 October 2014. ^ "passeport 2010". crccf. UofOttawa. Retrieved 4 April 2015. ^ a b "Le plus ancien pavillon de l'Université d'Ottawa". L'express Ottawa. Archived from the original on 19 October 2014. Retrieved 4 April 2015. ^ "Regulation on Bilingualism at University Of Ottawa 1974". University of Ottawa. Archived from the original on 6 June 2012. Retrieved 29 May 2012. ^ "1989: New heart for newborn baby". CBC Digital Archives. Canadian Broadcasting Corporation. 2012. ^ "Second World War memorial: University of Ottawa: Memorial 35061-020 Ottawa, ON". National Inventory of Canadian Military Memorials. Veterans Affairs Canada. Retrieved 7 January 2017. ^ "Colonel By Hall: University of Ottawa: Memorial 35061-037 Ottawa, ON". National Inventory of Canadian Military Memorials. Veterans Affairs Canada. Retrieved 7 January 2017. ^ a b c d "Facts - Physical Resource Services". University of Ottawa. Retrieved 6 June 2012. ^ "Space Inventory by Building 2010-2011". University of Ottawa. Retrieved 6 June 2012. ^ "Maps". University of Ottawa. Retrieved 6 June 2012. ^ "University of Ottawa buys Algonquin college's Lees campus". canada.com. Postmedia Network Inc. 8 January 2007. Archived from the original on 21 June 2014. Retrieved 6 June 2012. ^ "Overview". University of Ottawa Library. Retrieved 21 December 2016. ^ "Locations". University of Ottawa Library. Retrieved 21 December 2016. ^ "Museum of Classical Antiquities". University of Ottawa. Retrieved 28 June 2012. ^ "Gallery 115". vasaaeav.com. Archived from the original on 20 October 2014. Retrieved 14 October 2014. ^ "Designated Students' Residences, Part II - Universities". Queen's Printer for Ontario. October 2011. Archived from the original on 29 April 2012. Retrieved 7 June 2012. ^ "Residences at the University of Ottawa". University of Ottawa. Retrieved 7 June 2012. ^ "Annex". Housing Service. Retrieved 2018-02-04. ^ "Section E1 Residence of First-Time, Full-Time, First-Year Undergraduate Students". University of Ottawa. Retrieved 7 June 2012. ^ a b "RAUO - Residents' Association of the University of Ottawa". University of Ottawa. Retrieved 7 June 2012. ^ a b "University Centre". University of Ottawa. Retrieved 7 June 2012. ^ "Food Options On Campus". University of Ottawa. Archived from the original on 8 January 2012. Retrieved 7 June 2012. ^ "Roger Guindon Hall". University of Ottawa. Archived from the original on 9 April 2012. Retrieved 6 June 2012. ^ "Affiliated Hospitals and Institutes". University of Ottawa. Retrieved 6 June 2012. ^ "Our Partners". The Ottawa Hospital. 2012. Retrieved 6 June 2012. ^ a b "Centre for Executive Leadership". University of Ottawa. Archived from the original on 27 June 2012. Retrieved 6 June 2012. ^ "Community". University of Ottawa. Archived from the original on 17 March 2014. Retrieved 29 May 2012. ^ "Mission". McMaster University. 2008. Retrieved 15 May 2011. ^ "University of Ottawa Sustainable Development Committee". University of Ottawa. Retrieved 29 May 2012. ^ "Talloires declaration institutional signatory list". University Leaders for a Sustainable Future. 22 October 2010. Archived from the original on 23 January 2013. ^ a b c d e "RecycleMania 2012". University of Ottawa. Retrieved 19 November 2012. ^ a b c d "Free Store". University of Ottawa. Retrieved 19 November 2012. ^ "La " gratuiterie " récupèreet redistribue". 20minutes.fr. 20minutes.fr. 25 May 2011. Retrieved 16 December 2014. ^ a b c d e f g h i j "A Faculty at the Forefront of Sustainability". University of Ottawa. Archived from the original on 29 March 2013. Retrieved 19 November 2012. ^ Living Walls, Nedlaw. "University of Ottawa: Project Details". Nedlaw Living Walls. Retrieved 16 March 2014. ^ Living Walls, Nedlaw. "University of Ottawa: Project detail". Nedlaw Living Walls. Retrieved 16 March 2014. ^ "Office of Campus of Sustainability: Green Buildings and Greenspace". University of Ottawa. Retrieved 16 March 2014. ^ "Office of Campus Sustainability". University of Ottawa. Retrieved 16 March 2014. ^ "Office of Campus of Sustainability: Community Garden". University of Ottawa. Retrieved 16 March 2014. ^ "Office of Campus Sustainability: Community Garden". University of Ottawa. Retrieved 16 March 2014. ^ "News: Sustainability at the University of Ottawa". University of Ottawa. Archived from the original on 16 March 2014. Retrieved 16 March 2014. ^ "About AASHE". AASHE. Retrieved 19 November 2012. ^ "Sustainability Advancement and Tracking System". Tufts University. Retrieved 19 November 2012. ^ "Overview". AASHE. Archived from the original on 15 October 2012. Retrieved 19 November 2012. ^ "Administration and Governance". University of Ottawa. Retrieved 20 June 2012. ^ "Board of Governors". University of Ottawa. Retrieved 20 June 2012. ^ a b "Members of the Board of Governors". University of Ottawa. Retrieved 20 June 2012. ^ a b c d "University of Ottawa Act, 1965". University of Ottawa. Retrieved 20 June 2012. ^ "Senate". University of Ottawa. Retrieved 20 June 2012. ^ "Members of the Senate". University of Ottawa. 20 June 2012. ^ "Past Presidents". University of Ottawa. 20 June 2012. ^ "2015 Registered Charity Information Return for Universite d'Ottawa". Canada Revenue Agency. 30 April 2015. Retrieved 21 December 2016. ^ "2012 Economic Impact Study" (PDF). 15 May 2012. Retrieved 19 February 2015. ^ "University of Ottawa". Association of Universities and Colleges of Canada. 2012. Archived from the original on 20 May 2012. Retrieved 29 May 2012. ^ "Universities". Queen's Printer for Ontario. 2011. Retrieved 29 May 2012. ^ "Important dates & deadlines". University of Ottawa. Retrieved 29 May 2012. ^ "Common University Data Ontario - Section A". University of Ottawa. Retrieved 12 March 2019. ^ "U of O contributes billions to economy each year: study". Ottawa Business Journal. Great River Media. 24 May 2012. Archived from the original on 17 March 2014. Retrieved 28 May 2012. ^ "French Language and Bilingual Colleges and Universities". Queen's Printer for Ontario. 13 April 2011. Retrieved 29 May 2012. ^ Brink, Chris (2006). No Lesser Place: The Taaldebat at Stellenbosch. African Sun Media. p. 54. ISBN 1-9199-8095-4. ^ "Administration and Governance - University of Ottawa". www.uottawa.ca. ^ "The Institute". University of Ottawa. Retrieved 29 May 2012. ^ "Association des universités de la francophonie canadienne" (in French). association des universités de la francophonie canadienne. 2012. Archived from the original on 6 July 2011. Retrieved 29 May 2012. ^ "University of Ottawa" (PDF). Moody's Investors Service Credit Analysis. Moody's Investors Service, Inc. January 2010. p. 2. Retrieved 29 May 2012. ^ "Goal 1 - To play a leadership role in promoting Canada's official languages" (PDF). Vision 2010 Assessment - Strategic Plan. University of Ottawa. March 2009. p. 8. Archived from the original (PDF) on 15 April 2012. Retrieved 29 May 2012. ^ "11 universities bail out of Maclean's survey". Canadian Broadcasting Corporation. 14 April 2006. Retrieved 27 January 2011. ^ "U15 Submission to the Expert Review Panel on Research and Development" (PDF). Review of Federal Support to R&D. 18 February 2011. Retrieved 22 July 2011. ^ "Office of the Vice-President, Research". University of Ottawa. Retrieved 30 May 2012. ^ "uOttawa Research Centres and Institutes". University of Ottawa. Retrieved 30 May 2012. ^ "Research Facts". University of Ottawa. Archived from the original on 6 June 2012. Retrieved 30 May 2012. ^ a b c d "Programs Offered". University of Ottawa. Retrieved 19 November 2012. ^ a b c "Policies and Procedures FAQ's". University of Ottawa. Retrieved 19 November 2012. ^ a b c d e f g "Prospective Students". University of Ottawa. Retrieved 19 November 2012. ^ a b c "Prospective Students". University of Ottawa. Retrieved 19 November 2012. ^ "Policies and Procedures FAQ's". University of Ottawa. Retrieved 19 November 2012. ^ a b "Working Abroad". University of Ottawa. Retrieved 19 November 2012. ^ "University of Ottawa". Retrieved 29 May 2012. ^ "Institution Research and Planning, University of Ottawa". Retrieved 6 June 2016. ^ "Section B3 Secondary School Averages of Entering First-Time, Full-Time, First Year Students by Range and Program, 2010". University of Ottawa. Retrieved 29 May 2012. ^ "Section K3 Retention Rates 2009". University of Ottawa. Retrieved 29 May 2012. ^ "Government Financial Aid". University of Ottawa. Retrieved 29 May 2012. ^ "University of Ottawa Scholarships and Financial Aid 2008-2013" (PDF). Retrieved 3 June 2012. ^ "Common University Data Ontario - 2016: University of Ottawa". Council of Ontario Universities. July 2016. Retrieved 4 March 2018. ^ "UOSU- About Us". The University of Ottawa Students' Union. Archived from the original on 2 February 2019. Retrieved 25 February 2019. ^ "GSAÉD - About Us". GSAÉD. 2012. Archived from the original on 14 September 2012. Retrieved 28 June 2012. ^ "SFUO Clubs: Listing". Student Federation of the University of Ottawa. Archived from the original on 25 May 2012. Retrieved 28 June 2012. ^ "Fulcrum - About Us". The Fulcrum. 2012. Retrieved 28 June 2012. ^ "La Rotonde" (in French). La Rotonde. 2012. Retrieved 28 June 2012. ^ "About CHUO". CHUO. Retrieved 28 June 2012. ^ "Virtual Campus Tour - Sports Services". University of Ottawa. Retrieved 27 May 2012. ^ "Alumni Relations". University of Ottawa. Archived from the original on 5 May 2012. Retrieved 27 May 2012. ^ a b "Facilities". University of Ottawa. Retrieved 27 May 2012. ^ "A new era for Gee-Gees football and a playing field open year round for the whole community". Archived from the original on 16 July 2014. Retrieved 3 June 2014. ^ "Full-ride athletic scholarships still on hold". Macleans. Rogers Publishing Limited. 4 June 2010. Retrieved 11 July 2011. ^ "Michael Brock, Department of History". University of Ottawa. Retrieved 9 March 2012. ^ "Dr. Christl Verduyn, Professor". Mount Allison University. 2011. Archived from the original on 23 April 2012. Retrieved 9 March 2012. ^ O'Malley, Martin. "Carol Shields". CBC News. Canadian Broadcasting Corporation. Retrieved 9 March 2011. ^ "A page in time: Pauline Vanier, uOttawa's first woman chancellor". The Gazette. University of Ottawa. 22 November 2011. Archived from the original on 10 July 2012. Retrieved 9 March 2012. ^ "The Right Honourable Jules Léger: Governor General". Government of Canada. 30 April 2009. Retrieved 9 March 2012. ^ "Maurice Sauvé". The Canadian Encyclopedia. Historica Dominion Institute. 2012. Retrieved 9 March 2012. ^ Bélanger, Claude (2004). "Newfoundland Biography (1497-2004)". Marianopolis College. Retrieved 9 March 2012. ^ "Honorary Degree Citation - Paul Martin". Concordia University. 2010. Retrieved 9 March 2012. ^ Leadlay, Christina (1 December 2005). "Diplomatic Circles". Embassy News. Hill Times Publishing. Retrieved 13 September 2017. ^ "YANG Philemon". Prime Minister's Office of Cameroon. 2017. Archived from the original on 7 September 2018. Retrieved 8 September 2018. ^ Bell, Stewart (12 December 2013). "Abdiweli Sheikh Ahmed, a Somali-Canadian economist, named Prime Minister of Somalia". National Post. Postmedia Network Inc. Retrieved 19 May 2017. ^ "Gabriela Michetti, la nueva vicepresidenta". Diario26 (in Spanish). Telecentro S.A. 22 November 2015. Retrieved 19 May 2017. ^ "Nunavut Premier Paul Okalik ('97) Elected to Third Term in Territory's Legislature". University of Ottawa. Retrieved 9 March 2012. ^ "Biography Dalton McGuinty". Liberal Caucus Service Bureau. 2010. Archived from the original on 5 April 2012. Retrieved 9 March 2012. ^ "InDepth: Louise Arbour". CBC News. Canadian Broadcasting Corporation. 11 March 2008. Retrieved 9 March 2012. ^ "The Honourable Mr. Justice Michel Bastarache". Supreme Court of Canada. 17 January 2011. Archived from the original on 29 August 2012. Retrieved 9 March 2012. ^ "The Honourable Mr. Justice Louis LeBel". Supreme Court of Canada. 6 February 2012. Archived from the original on 15 May 2013. ^ Canada, Supreme Court of (1 January 2001). "Supreme Court of Canada - Biography - Richard Wagner". Archived from the original on 29 October 2013. Retrieved 28 October 2013. ^ "The Right Honourable Joseph Honoré Gérald Fauteux, P.C., C.C." Supreme Court of Canada. 6 January 2006. Archived from the original on 16 February 2012. Retrieved 9 March 2012. ^ "Daniel Lamarre". University of Ottawa. Retrieved 9 March 2012. ^ "The Honourable Paul Desmarais, P.C., C.C., O.Q." Power Corporation of Canada. 2012. Retrieved 9 March 2012. ^ "André Desmarais, O.C., O.Q." Power Corporation of Canada. 2012. Retrieved 9 March 2012. ^ Spears, Tom (9 November 2015). "Air Canada CEO Rovinescu new chancellor of UOttawa". Ottawa Citizen. Postmedia Network Inc. Retrieved 19 May 2017. ^ Who's who in Canada: an illustrated biographical record of men and women of the time, Volume 89. International Press Limited. 1998. p. 520. ISBN 0-7715-7562-9. ^ Loop, Emma (5 May 2015). "Jeopardy! host Alex Trebek has building at the University of Ottawa named in his honour". Ottawa Citizen. Retrieved 18 September 2015. ^ "Crudden, Cathleen | Department of Chemistry". www.chem.queensu.ca. Retrieved 2018-09-17. ^ "Biography of Dr. Dafydd (Dave) Rhys Williams". Canadian Space Agency. Government of Canada. 1 March 2008. Retrieved 19 May 2017. Wikimedia Commons has media related to University of Ottawa.